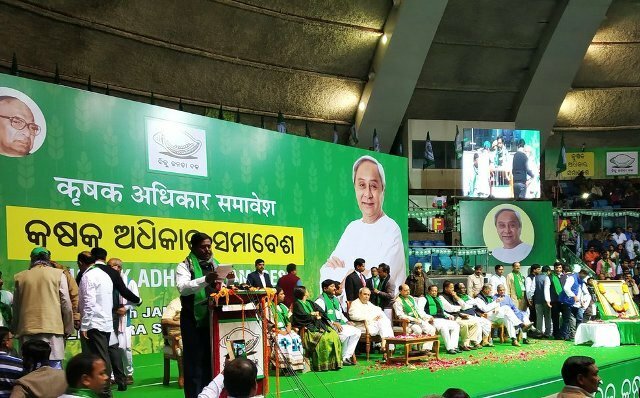 ONI Bureau: Odisha Chief Minister and BJD supremo Naveen Patnaik attended the Biju Krushak Janata Dal’s dharna at the Talkatora Stadium in New Delhi today. Over 2000 protestors including BJD MPs, MLAs, district presidents, members of the party youth wing, women and BJD workers joined the protest. He further stated that Odisha Govt have requested Central Government several times to increase the Minimum Support Price for paddy. Odisha Assembly has also passed a resolution and sent to the Centre to hike the Minimum Support Price by one and half times. But nothing has happened. However, BJP has forgotten the promises made to farmers after it came to power. It is the responsibility of the Central Government to fix the minimum support price for food grains and implement M.S. Swaminathan Committee’s Report. Central Government can’t escape from this responsibility, Naveen added.